Subsurface energy fluxes, denoted QG, are flows of energy between the surface and the underlying snow or ice. These arise due to thermal diffusion and penetration of shortwave radiation. These processes are discussed above with respect to the internal temperature distribution in the snowpack. For the surface energy balance of concern here, these exchanges represent a flow of energy either toward or away from the snow/ice surface. Diffusive energy exchange between the surface and subsurface occurs in the presence of a temperature gradient as per (3.3). Conductive heat flux to the surface, QGc, is positive when 2T/2z < 0. The sign of QGc is variable and the magnitude is usually small: | QGc | < 10 W m-2. There is commonly a radiatively driven diurnal cycle in QGc associated with diffusion of atmospheric temperature variations to depths of a few decimeters. In isothermal snow or ice, 2T/2z = 0, giving QGc = 0. However, there can still be diurnal cycles in the near-surface, driven by overnight longwave cooling. This does not occur if free water is present at the surface, as energy losses drive refreezing. The associated latent heat release provides a thermal buffer that helps to maintains surface temperatures near 0°C. Transmitted shortwave radiation, QGS, warms or melts the underlying snow or ice. 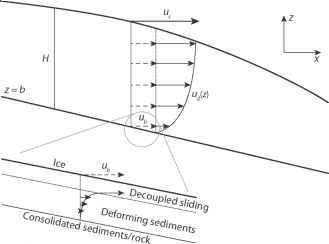 Because longwave radiation losses induce surface cooling, it is not unusual to find a frozen surface layer overlying subsurface meltwater pockets in ice. QGS represents a reduction in the absorbed shortwave radiation that is available for surface melt, QS* (1 — as ), but it is often convenient to count this within Qg: Qg = QGc — Qgs. There can also be sensible heat transport by meltwater percolation into a snowpack, but this is rarely measured or modeled.